Demon International based in the Westcountry is leading the way in innovative cleaning solutions for Holiday Parks in the UK. The Hurricane Combi is an Award winning innovation combining a flat surface rotowash cleaner with a pressure washer, allowing the user to wash flat surfaces using a high pressure cleaner and then quickly convert to a pressure washer for cleaning buildings, park furniture and vehicles with the addition of a lance. What’s more the Combi is fast and efficient and is the ideal solution for cleaning pavements, walkways, roads, play areas and more! 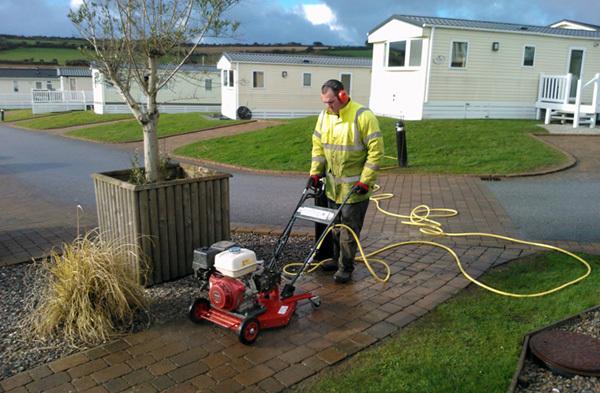 Haulfryn are one of the UK’s largest owners of prestigious holiday and residential parks and have been using the Hurricane Combi for a number of months across sites including Praa Sands in Devon. 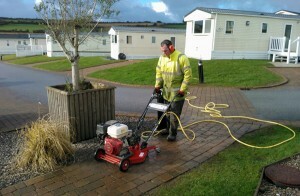 Pictured is the Combi in action for cleaning block paving walkways. Jake Harrison, Operations Manager, has been extremely impressed with the capabilities of the Combi and has never seen surfaces cleaned so well, the machine exceeded expectations.